A true Legend in overproof rums, Lemon Hart 151, is the "Gold Standard" sought after and coveted by rum enthusiasts worldwide. Many rum aficionados believe that there simply is no substitute for Lemon Hart 151. A true Legend in overproof rums, Lemon Hart 151, is the "Gold Standard" sought after and coveted by rum enthusiasts worldwide. 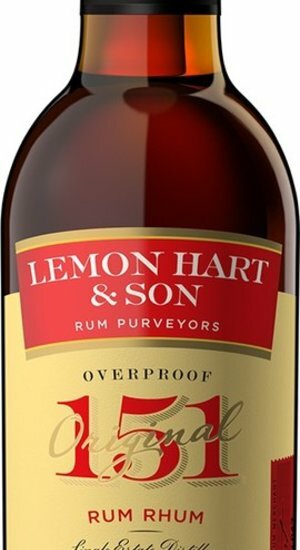 Many rum aficionados believe that there simply is no substitute for Lemon Hart 151.Lemon Hart 151 (75.5% abv) is blended to exacting standards from an age-old recipe of select high proof Demerara rums. The epitome of an exceptional rum, Lemon Hart 151 is best used as a float in drinks and signature cocktails alike, and is called for by name in many of Trader Vic's and Don the Beachcomber's classic drinks recipes. Rum always.